Todmorden with Walsden was in Lancashire prior to 1888, and after that became part of Yorkshire. See also Halifax. "TODMORDEN, a town, a township, and a chapelry, in Lancashire, and a sub-district and a district partly also in W. R. Yorkshire. The town stands on the river Calder, the Rochdale canal, and the Lancashire and Yorkshire railway, 7½ miles NNE of Rochdale; enjoys fine environs, overhung all round by lofty mountains; presents an irregularly-built and straggling appearance; is a seat of petty-sessions and county courts; publishes two monthly newspapers; carries on extensive manufactures of cotton, fustians, velveteens, satteens, iron-work, and machinery; and has a head post-office, a r. station with telegraph, a banking office, three chief inns, a police station, an Odd Fellows' hall, a marble statue of the late John Fielden set up in 1861, a handsome church of 1831, an old church now used only for mortuary services, five dissenting chapels, a mechanics' institute, national schools, a weekly market on Saturday, a cattle market on the first Thursday of every month, and two annual fairs, each of three days' continuance, the one from the Thursday before Easter, the other from 27 Sept. The township includes Walsden chapelry, bears the name of T. and Walsden, and is in Rochdale parish. Acres, not separately returned. Real property, £30,677; of which £2,252 are in mines, and £103 in quarries. Pop. in 1851, 7,699; in 1861, 9,146. Houses, 1,790. Dobroyd Castle, built in 1866-8, T. Hall, Stansfield Hall, Scaitcliffe, Centre Vale, and Ridgefoot are chief residences; and there are many handsome villas. The chapelry comprises all the township except Walsden. Pop., 5,212. The living is a vicarage in the diocese of Manchester. Value, £300. Patron, the Vicar of Rochdale. The sub-district includes part of Halifax parish; and had, in 1861, a pop. of 20,287. Houses, 4,031. The district includes also Hebden-Bridge sub-district, and comprises 26,920 acres, besides the area of T. township. Poor rates in 1863, £12,617. Pop. in 1851, 29,727; in 1861, 31,113. Houses, 6,435. Marriages in 1863, 133; births, 949,-of which 66 were illegitimate; deaths, 549,-of which 172 were at ages under 5 years, and 7 at ages above 85. Marriages in the ten years 1851-60, 1,289; births, 9,238; deaths, 6,122. The places of worship, in 1851, were 7 of the Church of England, with 4,950 sittings; 3 of Independents, with 1,120 s.; 13 of Baptists, with 4,092 s.; 1 of Quakers, with 250 s.; 1 of Unitarians, with 400 s.; 11 of Wesleyans, with 3,731 s.; 4 of Primitive Methodists, with 1,090 s.; 8 of the Wesleyan Association, with 1,981 s.; and 1 undefined, with 350 s. The schools were 18 public day-schools, with 1,773 scholars; 45 private day-schools, with 1,550 s.; 46 Sunday schools, with 7,104 s.; and 7 evening schools for adults, with 156 s. There is no workhouse." The following books contain useful information about the history of Todmorden and the surrounding area. Details about the census records, and indexes for Todmorden with Walsden. You can also perform a more selective search for churches in the Todmorden area or see them printed on a map. A picture of St Peter's, Walsden. The Register Office covering the Todmorden area is Calderdale. Ask for a calculation of the distance from Todmorden with Walsden to another place. "TODMORDEN, a market and post town in the parish of Rochdale, hundred of Salford, county Lancaster, 9 miles N.E. of Rochdale, and 12 W. of Halifax. It is a station on the eastern section of the Lancashire and Yorkshire railway, where the Burnley branch turns off. This place, anciently called Todmaredene, or "the valley of the Foxmere," is situated in the vale of the Calder, near the Halifax and Rochdale canal, and on the Yorkshire border, where it extends into the parish of Halifax. The town is well built and lighted with gas, and is under the local government of a board of magistrates, with a police inspector and two constables. Petty sessions are held once a fortnight, and a county court once a month at the Odd Fellows' Hall. The population of the town in 1861 was 11,797, of which number the township of Todmorden, including the hamlet of Walsden, contained 9,146 against 7,699 in 1851, the remainder were residents within the adjoining townships of Langfield and Stansfield. The gas-works were erected in 1847, at an expense of £10,000, and a savings-bank in 1857; there are also a branch of the Manchester and Liverpool bank, a police station with lock-up, and several hotels. Many of the inhabitants are employed in the cotton mills, which trade includes various branches, as cotton spinning, fustians, velveteens, satteens, dimities, and calicoes; the manufacture also of worsted goods has been introduced, and there are foundries and machine works of great magnitude, these last chiefly engaged in supplying the extensive manufactories in the neighbourhood. Water, stone, timber, and coal are abundant, which add to the advantages of this as a manufacturing district. In addition to the numerous water-mills on the banks of the Calder, there are in the township several factories where the machinery is wholly propelled by steam; but hand-loom weaving is now extinct. In the adjoining township of Langfield stands a stone column, first erected in 1815, to commemorate the termination of the French war; but having fallen down, was subsequently re-erected by subscription, at an expense of about £800. The principal seats are Scaitcliffe, Todmorden Hall, Stansfield Hall, Centre Vale, and Ridge Foot. The Poor-law Union comprises 6 townships, but there is no union workhouse, the poor being relieved at their respective townships. Genealogical and historical information about Todmorden and Walsden. In 1835 Todmorden with Walsden was a township in the parish of Rochdale. Prior to 1888 this township and half of the town of Todmorden was in Lancashire, the other half being in the West Riding of Yorkshire. From 1 January 1888 all of Todmorden became part of Yorkshire. 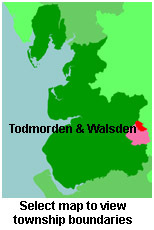 You can see the administrative areas in which Todmorden with Walsden has been placed at times in the past. Select one to see a link to a map of that particular area. A description of Todmorden in the 19th century. View maps of and places within its boundaries. For probate purposes prior to 1858, Todmorden with Walsden was in the Archdeaconry of Chester, in the Diocese of Chester. The original Lancashire wills for the Archdeaconry of Chester are held at the Lancashire Record Office.